An informal and harmonious cohousing neighbourhood which is open to all who share, or have an interest in, our values. Our vision is of beautiful shared spaces and places to live, work and play that benefit the wider community as well as residents, guided by the principles of equality and sustainability. Affordability: house prices and rents at 80% of market rate. Shared facilities mean individual units can be smaller and more affordable. Mutual support cuts living costs. Community facilities: the project aims to provide a range of facilities and services for residents and the wider community: such as a car club, playgroup, special interest groups, and the community allotment. 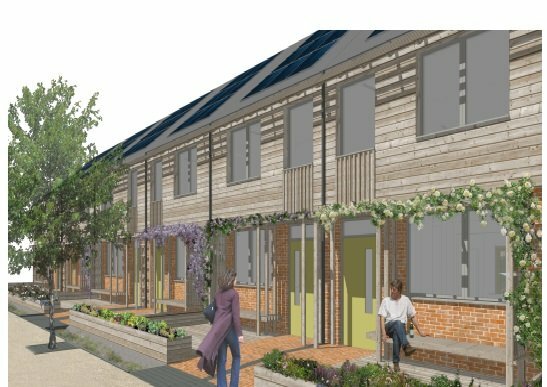 Phase 2 has now gained planning permission and will provide 10 housing association homes for affordable rent for local people; 9 homes for leasehold sale; and further shared green space.